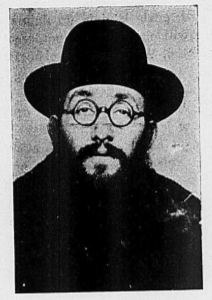 He edited the Bais Yaakov Journal from its 1923 founding until 1939, running the operation from his Lodz offices. He was the driving force behind Bnos Agudath Israel, which was founded in 1926 by bringing together a few existing groups under a national umbrella. In 1928, he opened a Bais Yaakov publishing company, publishing textbooks, anthologies, Sarah Schenirer’s Collected Writings and other works, and his own writings, including a children’s biography of Schenirer–Di Mames Tzavo’e [Mama’s Will]. Finally, he was the founding director of the Łódź vocational training institute, which was renamed Ohel Sarah in 1936 in honor of Sarah Schenirer, and which trained hundreds of students in Jewish Studies as well as programs in dressmaking, secretarial work, bookkeeping, business, childcare, hygiene and nursing. Friedenson was murdered in the Holocaust. His son Joseph (Yosel) Friedenson (1922-2013) carried on his father’s work in the United State, founding and editing the Agudah newspaper Dos Yidishe Vort, and writing about the history of the Bais Yaakov movement.